LP and Little Man love to read – they take after Dave and I – and so we are forever buying new books for them. More often than not they would rather have a new book than a new toy and so, for a long time now, The Book People has been my first port of call when shopping for books online. LP has got to the stage now where she can read books by herself. She has progressed through the large format picture books that she loved from her toddler days and instead now reads books with just a few pictures and real chapters. She’ll read a chapter before bed and will pick the book back up again first thing in the morning. The Book People have so many children’s books including many book collections on their website and we have gradually invested in more of them as the years have gone by. But, The Book People sent LP a few more to add to her little library that she’s just starting to work her way through. There are books I loved as a child – The Secret Seven and The Famous Five – and other series that are completely new to me, and LP. Things like Dotty Detective and Mariella Mystery Investigates. They have such strong female characters in them and lovely storylines – things that LP can really get into and enjoy. I know that LP will work her way through these books so quickly but they will also be books she’ll come back to, reading them time and time again. Plus, she loves having books in a series, where she can get to know the characters and see them going on all different adventures, making new friends and doing new things. Like a movie franchise, she loves investing in the characters in books so I know that these new additions will keep her engaged for a long time to come. Little Man still loves shorter books. Books with pictures that cover the pages and with stories written in verse that he can almost sing as he reads. He’s had new additions to his book collection too with books like Remember 10 with Explorer Ben, The Gloriumptious Worlds of Roald Dahl, The Pirates of Scurvy Sands, The School of Music and Great Women Who Made History. They are all beautiful hardback books, ones that still feel quite robust as he’s reading them and ones I know will be safe in his little hands. He is just starting to read himself and he is always so proud when he recognises a word but, at bedtime, he loves for Dave or I to read with him, reading the story to him so he can just enjoy the story whilst looking at the pictures. The Book People have so many handpicked favourites, books that they know children will love. Plus, their books span a whole childhood – I know we have been buying their books since the children were born and investing in titles we knew would be enjoyed for years. I love how much the children love to read and it’s so nice to have so many beautiful books at home for them to read, share and enjoy. Reading is such a big part of our lives and I love seeing the children with their head in a book and seeing their imaginations grow as the months and years go by. Oh I love this! My two are just the same about books, they get so much more joy from books than toys. We’re currently reading the whole box set of the Faraway Tree for the second time. Might have to head to the Book People for that Famous Five box set afterwards, they hate it when their box set ends and that looks like it would keep them going for ages! Whenever I’m looking to buy the kids some new books, the book people website is always my first port of call. Their offers are unbeatable I think! 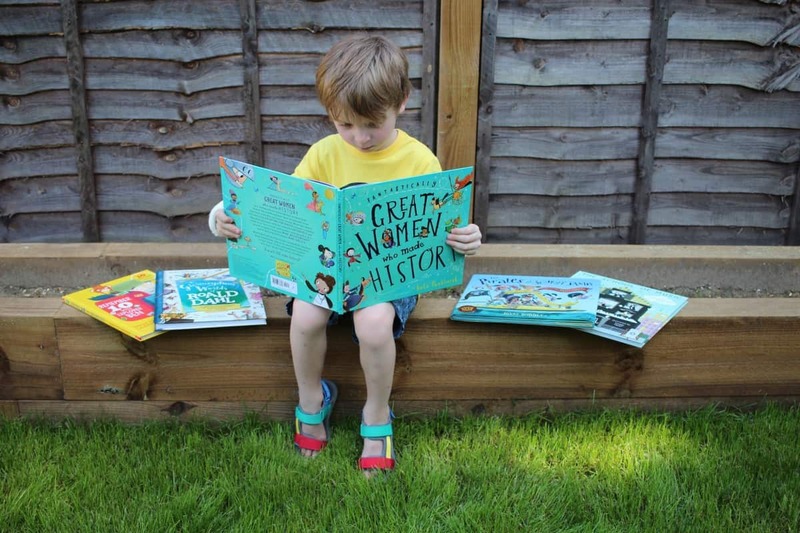 We really love Usborne books (they’re super high quality) and often find really good deals for them that cannot be matched elsewhere. When did Easter turn into Alice in Wonderland? What sort of Digital Imprint are we leaving for our Children? What does Online Safety mean to You? Why aren’t you Wearing a Bra Mummy?